Melts in your mouth, not in your hands — or space station. M&M's in space give new meaning to "playing with your food." When it comes to candy in space, it is not just about Mars bars and Milky Ways. Most of the popular sweets that children, dressed up like astronauts (among their other costumes), will get trick or treating this Halloween have, at one time or another, been launched to orbit as treats for the real astronauts in space. And while the six people onboard the International Space Station (ISS) won't be visited by any candy seekers this Wednesday (Oct. 31), a Russian spacecraft will perform a "trick" to possibly deliver treats for the crew. The unmanned Progress resupply capsule set to launch on Halloween will arrive at the orbiting outpost the same day — a "trick" only attempted to the ISS one time before. Usually, the cargo and other visiting vehicles take two to three days to get to the station. "Halloween happens to be one of my favorite holidays just because it is a lot of fun, people act goofy and there is always candy involved," Expedition 33 commander Sunita Williams told collectSPACE.com during a recent interview from on board the International Space Station. "We are hoping that we open the door and there will be a little bit of treats in the Progress." There may be sweets, but they won't be holiday treats. "We did not specifically put Halloween candies on [board the Progress] for the crew," Michelle Pittman, a registered dietician at Johnson Space Center's Space Food Systems Laboratory in Houston, told collectSPACE.com. It is not unusual though, for crew members to request — and receive — candy with care packages sent on resupply vehicles. Williams recently received one of her favorites, "Bull's Eye" caramels, on the SpaceX Dragon capsule, the first U.S. commercial cargo spacecraft, that returned to a successful splashdown on Sunday (Oct. 28). But even if there are no new treats on Progress M-17M, it won't mean it will be a candy-less Halloween on the space station, Pittman said. "There are probably plenty of sweets, plenty of candy, up on the station right now," she explained. "We do get a lot of requests for chocolates and sweets and candies. [The astronauts] think they are going to miss those items here, so they often request sweet items." One of the most famous candies in space is M&M's — or rather, as NASA calls them, "candy-coated chocolates." "Candies that are part of our space food program we have to relabel and keep out the brand names," Pittman said. 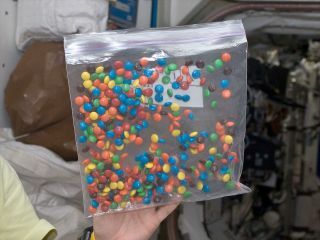 The candy-coated chocolates, which retain their individual printed "M's" but are otherwise repackaged by NASA in single-serving clear plastic, vacuum-sealed bags, are one of the few sweets that were requested so often that they were added to the regular menu available to astronauts. The candies remained more or less generic until astronaut Shannon Lucid spent 188 days aboard the Russian space station Mir in 1996. When asked what she missed most back on Earth, she famously replied from orbit, "I guess the only thing that would be nice is to have a few more M&M's." Most other candies are flown in bonus food containers as crew-choice items. "Anything we fly in the bonus containers, we do not really label or take off brand names," Pittman said. That means that the Twix and yes, Milky Way bars that have flown have kept their original wrappers. And Pittman said that just about any candy can fly — unless it is going to create a mess. "Anything that would make a mess, like [Wonka-brand] Nerds, probably [won't fly] because they are too small and would just make a mess everywhere," she said. Among the sweets that have flown and been consumed in space include Sweet Tarts, Snickers, Starburst, Reese's Peanut Butter Cups, Mentos, and the perennial Halloween favorite, candy corn. Click through to collectSPACE.com for a longer list of candies that have flown in space.